It's nice to see a post about these interesting watches. Have you seen this really strange jump hour? Probably not worth the money but it looks good. That is a neat watch--first I've seen a mechanical driver. 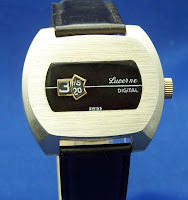 Gruen did a Curvex driver's watch, although their version was different. 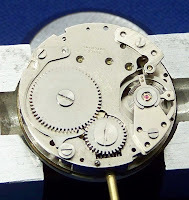 Conventional face, but a curved movement, and a case designed to sit on the side of the wrist. That Curvex is certainly unusual, and not something I've seen before. The Amida ones are sometimes available on Ebay for a lot less than the price of the one I linked to, so you might well get lucky. Real or not, it's a very styley watch. Wanty, wanty. Now I know what to look for!